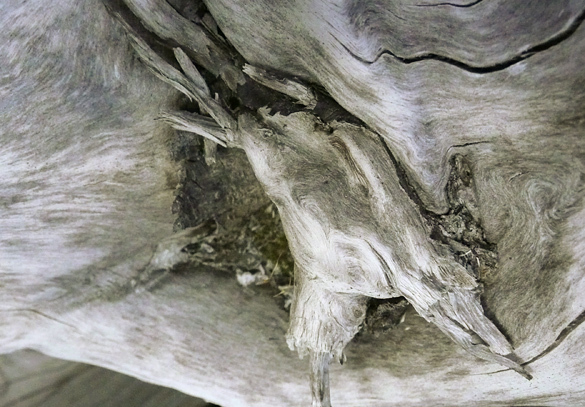 Driftwood is really quite remarkable. I think its ability to capture and hold one’s attention may well be unsurpassed. Thank you for these pictures. I’m interested that my immediate reaction to the first photo was that it must be upside down. We have such a strong urge to ‘make something’ of what we see. 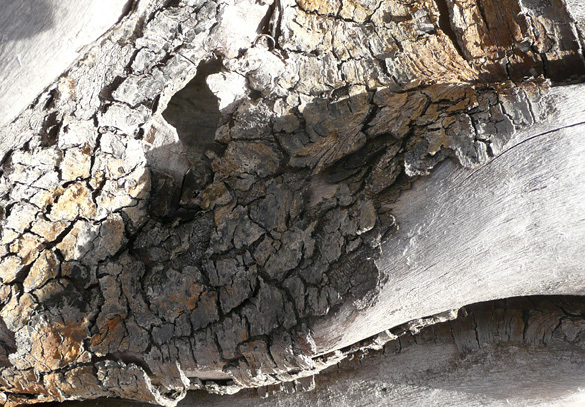 I find the extreme contrasts in the second two show up interesting depths in and around the bark, and the contrasting smoothness of the trunk under. Tom, yes, quite remarkable. One sees the smooth bones of former trees, sometimes still with bits of bark and the shreds of wood where limbs were ripped apart by storms. I love the variety of textures and shapes. Olga, I went back to the original photo to see if I had changed it but no, that’s the way it was photographed. That portion of the driftwood was somewhat on the underside curve so that might be why there is a bit of distortion. Funny how our eye perceives things, especially if they seem “not quite right” in some way. I remember I was quite excited by the low early evening light in how it created some stunning contrasts. It’s strange just how reminiscent all three are of landscapes amid flowing water. The story of life, eh? 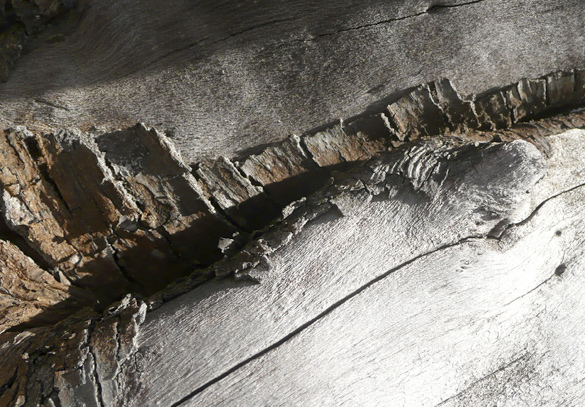 I love the silveriness of driftwood. Olga’s sense of ‘upside-down-ness’ in the first one might be from the fact that the lighting seem to be from underneath, rather that above. Susan, yes, you are right. Being from the landscape and worn and tossed by water, they still hold that feeling of both. Life’s traces…. With these thoughts I realize this repeats some of the same themes concerning the effects of time and weathering in my Meta-morphosis and Nexus series some years ago. Lucy, I like that silveriness too. And you are right, the light does seem to come from underneath in the first image. It is greatly increased by the ‘bounce’ from the brilliant sun hitting the deck beneath. I wish I had some of the pieces of driftwood I gathered as an adolescent on the California coast. We burned them! They did make wonderful firewood! Hattie, sometimes we don’t value these things when young. Besides one can’t keep everything, eh. The owner of this B&B obviously had a great place to display them well. We’ve carried home one or two larger ones but nothing as cool as these, but I do have several interesting little pieces still that I found near Tofino one year.